3 users are watching this product. Loading times getting your customers down? 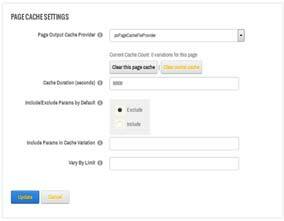 Turbo charge your DNN website with psPageCache, a DNN page caching module. 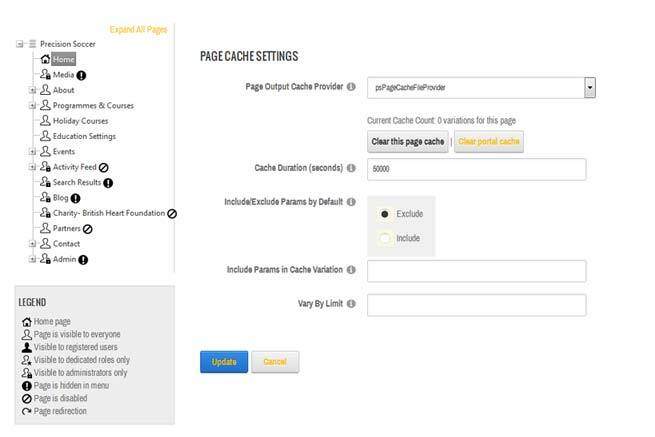 If you are looking for a quick and super effective way to enhance the performance of your DNN website then why not try our DNN page caching module - psPageCache. Easy to install and setup, psPageCache utilises and enhances the powerful in-built DNN page caching features to turbo charge your DNN website. psPageCache enables you to choose between file and memory based caching on a 'per page' basis, which means you can specify which parts of your website need a super boost. psPageCache works by creating and storing a cached HTML version of every page on whichever DNN website it is installed on. Instead of the CMS having to access the database each time a page is loaded, this cached version is sent back to the user instead. This drastically reduces the waiting times for users as there is no need to re-build the page from the database for every page request. psPageCache can store the cached page as a file or in memory, depending on what is required. So, why wouldn't you want to use psPageCache? The Single Domain licence allows the Licensee to install this package on one DNN portal using one domain/sub-domain. The Three Domain Licence allows the Licensee to install this package on three DNN portals using up to three different domains/sub-domains. This Licence permits the Licensee to install the Software on a Single DotNetNuke® Portal running off One domain/subdomain name combination without additional fees or licences. Each additional domain/sub-domain will require an additional licence. Permission is also granted to install the Product on to unlimited Test Domains in trial mode. This Licence permits the Licensee to install the Software on three DotNetNuke® Portals running off of up to Three domain/sub-domain name combinations without additional fees or licences. Each additional domain/sub-domain will require an additional licence. 1.1	Pure Systems is the name under which we trade and the Licensor of the Materials. 1.2	The Licensee means any person or party who purchases software from Pure Systems or an Agent acting on behalf of Pure Systems. 1.3	The Materials means the software, user guides and any other item included with the software. 1.4	DotNetNuke means the software framework used to create the website. 1.5	User Guide means the documents supplied as part of the Materials detailing the correct use of the supplied software. The Materials and related documentation are copyrighted works of authorship, and are also protected under applicable database laws. The Licensor retains ownership of the Materials and all subsequent copies of the Materials, regardless of the form in which the copies may exist. This licence is not a sale of the original Materials or any copies. 3.2	make copies of the Materials for back-up, archival or other security purposes. You may not use, copy, modify or transfer the Materials (including any related documentation) or any copy, in whole or in part, including any print-out of all or part of any database, except as expressly provided for in this licence. If you transfer possession of any copy of the Materials to another party except as provided above, your licence is automatically terminated. You may not translate, reverse engineer, decompile, disassemble, modify or create derivative works based on the Materials, except as expressly permitted by the law of this Agreement. You may not vary, delete or obscure any notices of proprietary rights or any product identification or restrictions on or in the Materials. The Materials are licensed only to you. You may not rent, lease, sub-license, sell, assign, pledge, transfer or otherwise dispose of the Materials, on a temporary or permanent basis, without the prior written consent of the Licensor. 6.3	hold all drawings, specifications, data (including object and source codes), software listings and all other information relating to the Materials confidential and not at any time, during this licence or after its expiry, disclose the same, whether directly or indirectly, to any third party without the Licensor's consent. 6.4	Make a complete backup of your DotNetNuke website and database before carrying out the installation of the Materials. 7.1	Subject to the limitations and exclusions of liability set out elsewhere in this Agreement, the Licensor warrants that the copy of the program in the Materials will materially conform to the documentation which accompanies the Materials. The period of the warranty is 90 days from the date of purchase. 7.2	The Licensor will indemnify you for personal injury or death solely and directly caused by any defect in its Materials or the negligence of its employees. 7.3	The Licensor shall not be liable under the said warranty above if the Materials fail to operate in accordance with the said warranty as a result of any modification, variation or addition to the Materials not performed by the Licensor or caused by any abuse, corruption or incorrect use of the Materials, including use of the Materials with equipment or other software which is incompatible. 8.1	The foregoing warranty is made in lieu of any other warranties, representations or guarantees of any kind, either expressed or implied, including, but not limited to, any implied warranties of quality, merchantability, fitness for a particular purpose or ability to achieve a particular result. You assume the entire risk as to the quality and performance of the Materials. Should the Materials prove defective, you (and not the Licensor nor any licensed reseller) assume the entire cost of all necessary servicing, repair or correction. The Licensor does not warrant that the Materials will meet your requirements or that its operation will be uninterrupted or error free. 9.2	If, during the period of warranty, the Licensor is unable to deliver replacement Materials which are free of material defects, you may terminate this Agreement by returning the Materials to the Licensor and any money you paid to the Licensor for the Materials will be refunded. 9.3	If the Licensor considers that it attracts any liability whatsoever resulting from the supply of the Materials to the Licensee then such liability shall be limited to the cost of the replacement Materials and nothing else. 10.1	Except in respect of personal injury or death caused directly by the negligence of the Licensor, in no event will the Licensor be liable to you for any damages, including any lost profits, lost savings, loss of data or any indirect, special, incidental or consequential damages arising out of the use of or inability to use such Materials, even if the Licensor has been advised of the possibility of such damages. Nothing in this Agreement limits liability for fraudulent misrepresentation. 11.1	The Licensee agrees that it uses the Materials at its own risk and will indemnify the Licensor against all claims, proceedings, demands, costs, charges, expenses, or any other thing, howsoever incurred resulting from the Licensee’s use of the Materials provided by the Licensor under the Contract. 11.2	The Licensee agrees that the Licensor shall not be held liable for any interruption or breakdown in the operation of any Materials or services provided by the Licensor under the contract, where the component part causing the interruption or breakdown has been supplied or provided by the Licensee or any third party. 12.1	The licence is effective until terminated. You may terminate it at any time by informing the Licensor in writing and forthwith destroying the Materials together with all copies in any form. It will also terminate upon conditions set out elsewhere in this Agreement or if you fail to comply with any term or condition of this Agreement or if you voluntarily return the Materials to us. You agree upon such termination to destroy the Materials together with all copies in any form. 13.1	You will comply with all applicable laws, rules, regulations and pay all duties and taxes if applicable governing export of goods and information, including the laws of the countries in which the Materials were created. In particular, you will not export or re-export, directly or indirectly, separately or as a part of a system, the Materials or other information relating thereto to any country for which an export licence or other approval is required, without first obtaining such licence or other approval. 14.1	Payment for the use of the Materials is payable in advance. 15.1	You agree that the Licensor shall have the right, after supplying undertakings as to confidentiality, to audit any computer system on which the Materials are installed in order to verify compliance with this software licence. 15.2	This Agreement sets out the terms and conditions in their entirety as agreed between the Licensor and Licensee and their respective agents, and supersedes all proposals, representations, understandings and prior agreements, whether oral or written, and all other communications between any party relating to the subject matter covered by the said Agreement. 15.3	Any clause or term, or obligation therein in this Agreement that is found to be invalid or unenforceable shall be deemed deleted and the remainder of the clause or term, or obligation therein in this Agreement shall not be affected by that deletion. 15.4	Failure or neglect by either party to exercise any of its rights or remedies under this Agreement will not be construed as a waiver of that party's rights nor in any way affect the validity of the whole or part of this Agreement nor prejudice that party's right to take subsequent action. 15.5	The Licensee may not assign, transfer, sub-contract or otherwise part with this Agreement or any right or obligation under it without the Licensor's prior written consent. 15.6	In the event of the Materials developing a fault, you should notify the Licensor immediately. Notification procedures are detailed in the supplied User Guide as part of the Materials. 16.1	Each party irrevocably agrees that the law of this Licence Agreement and any dispute or claim of whatsoever kind arising from the use of the Materials shall be English Law.